Zimbra is a collaboration software app that provides you with a complete suite of social tools that include blogs and microblogs, forums and wikis, content editing and web pages, media galleries and video embedding, tags and tag clouds. With Zimbra, you can set up your personal profile, find others and send friend requests, create events and polls, like statuses, leave comments etc. With Zimbra, you can also set up a personal cloud with an inbox that is integrated with your email. With that personal inbox you can utilize the voice, task, address book, and calendar, files and the file sharing capabilities. You can use various features to stay connected with the team members in every time zone. The files and folders can be shared in a secure way with Zimbra. With Zimbra, you can gain a lot. You can search for expertise with the help of advanced Q&A tracking and reporting. To evaluate the content you can use the content reputation, quality scoring, badging and points. Due to the integration with Cisco and Mitel, you can get instant messaging, voicemail and click-to-call and call record history. Zimbra will also provide you with a social workflow through which the members can pose the challenges and suggest ideas. Also, with the help of social analytics, you can cause the community to become healthier and boost its effectiveness. The privacy and the control of your data are ensured while you run over the community on your premises – remember Zimbra is one of today’s most advanced tracking and reporting systems, and has thereof a reputation of a great management system that includes crowdsourced abuse reporting, extensible abuse management as well as reporting. The user interface is categorized as extremely friendly, flexible, and configurable. The same can be said concerning the app’s out-of-the-box integrations, and the varying pricing scheme designed to suit businesses from all scales and industries. Don’t forget that a 60-days fully-equipped trial is available for first time users, and that there is also a lifetime open-source package startups can use for free. Organizations have different needs and requirements and no software solution can be perfect in such a condition. It is pointless to try to find a perfect off-the-shelf software product that fulfills all your business wants. The intelligent thing to do would be to adapt the system for your specific wants, employee skill levels, finances, and other elements. For these reasons, do not rush and subscribe to well-publicized popular systems. Though these may be widely used, they may not be the perfect fit for your specific wants. Do your research, look into each short-listed system in detail, read a few Zimbra reviews, contact the maker for explanations, and finally select the app that presents what you require. How Much Does Zimbra Cost? The Zimbra Collaboration Server is sold according to the user mailbox in bundled packs. These packs are available in annual, multi-year, and perpetual software licenses. There is also an Open Source Editing available for Zimbra. It is a free email and collaboration solution that is the ideal of the individuals or small businesses or organizations that are not looking for a Zimbra Supports, the advanced administration and IMAP emails on the desktops. We realize that when you make a decision to buy Collaboration Software it’s important not only to see how experts evaluate it in their reviews, but also to find out if the real people and companies that buy it are actually satisfied with the product. That’s why we’ve created our behavior-based Customer Satisfaction Algorithm™ that gathers customer reviews, comments and Zimbra reviews across a wide range of social media sites. The data is then presented in an easy to digest form showing how many people had positive and negative experience with Zimbra. With that information at hand you should be equipped to make an informed buying decision that you won’t regret. What are Zimbra pricing details? 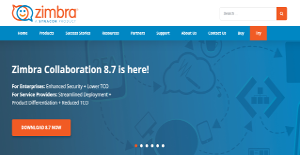 What integrations are available for Zimbra? If you need more information about Zimbra or you simply have a question let us know what you need and we’ll forward your request directly to the vendor.